Fresh eyes on London: Wanna Make a Daisy Chain? Wanna Make a Daisy Chain? How cute! You've got a really clear photo. My attempts at squirrels are always a bit blurred! I adore the squirrels of London's parks - whenever I go to sit in St James' for lunch I'm immediately surrounded! What a great picture! It looks like a poster! Yes, of course I would like do a daisy chain ... So cute! Little pun'kin! What a face! Muwah! so cute!! My mates always called squirrels tree rats - harsh? I love London squirrels. They're so friendly. Ha ha, how did you get the squirrel to pose so perfectly? Well done! What a shot! 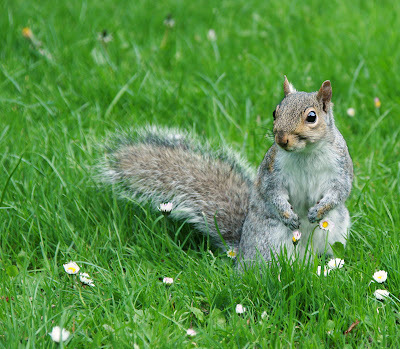 We took some pictures of those lovely squirrels at St. James's Park but none of ours is that good! Great, Mo! I've given you an award! Come to my blog to get it! Oh Madeline Bassett's God's daisy chain ?? Splendid !! You can't say no to a squirrel photo. That's a good one. This is superb photography. We don't get squirrels on the island and I do miss them. Back again. Just showed Gary this and he agrees this is a terrific image.